Join us on Saturday, March 11 at Crossroads North Middle School from 8:30AM - 2:00PM for our unConference! Educators, school librarians, and administrators are invited to discuss the ways we help learners develop their literacy skills. Whether you want to explore approaches to teaching news literacy, would like to share ideas about cross-curricular literacies, or are wondering about other hot topics, this day is for you. At the end of the conference NJASL membership will gather for a general membership meeting. 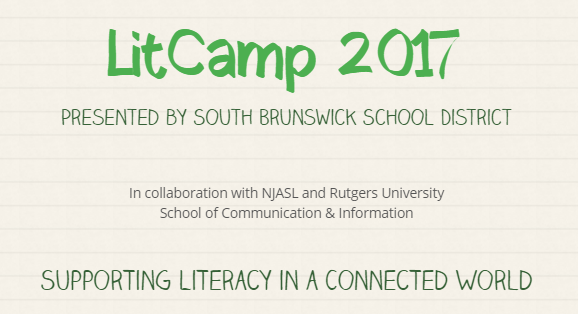 Visit the LitCamp2017 Smore to learn more and register. Apply for the Miss Rumphius Award! The New Jersey Center for the Book is currently seeking nominations for its Miss Rumphius Award. Based on the title character of Barbara Cooney’s wonderful book, Miss Rumphius, which won the National Book Award in 1983, this Award honors librarians, school media specialists, and educators who are stellar in spreading ideas and literacy. The deadline for submitting nominations is Wednesday, February 1, 2017. The nominee must be employed in New Jersey as a professional librarian, library staff member, certified educator, or teacher assistant, and must have developed creative activities to enhance learning and literacy. The activity should be collaborative, innovative, and able to be replicated by other librarians and educators. The nominee must be willing to help produce his or her program for other classrooms and/or libraries. A monetary amount of $200.00 and a NJCFB Miss Rumphius Award certificate will be presented to the recipient later in the year. The nomination shall include: the full name of the nominee and the place of employment; shall describe the activity or program in complete detail; shall describe the setting in which it takes place; shall indicate the collaborative aspects; shall indicate the innovative aspects of the program or activity and indicate how it can be replicated; shall include the full name and title of the nominator with address, email, phone number and fax number; shall include a letter of support from an administrator, from a former or current student, from a client or patron, or from a member of the staff. Please submit your nomination (self-nominations are accepted) for the Miss Rumphius Award to Carol Phillips (carolphillipslibrarian@gmail.com). If you have any questions, contact Carol Phillips, (carolphillipslibrarian@gmail.com). We are inviting administrators, supervisors, and curriculum coordinators to the NJASL Fall Conference, ESSA Session. They can attend the FREE session with the paid registration of a SLMS. See the embedded flyer for more information. Snapshot Day 2016 is Tuesday, October 18! Snapshot Day is an annual event organized by the New Jersey State Library and the New Jersey Library Association. Libraries across the state are invited to share their photos, statistics and stories on the social media platform of choice. The Snapshot Timeline tells you what's happening when. The New Jersey Association of School Librarians (NJASL), New Jersey Library Association (NJLA), LibraryLinkNJ, and local school librarians are united in our commitment that all New Jersey students have access to an effective school library program to ensure increased academic achievement, literacy and information literacy skills, and preparation for higher education. The Every Student Succeeds Act of 2015 (ESSA) provides an opportunity for New Jersey school districts to make this a reality. This new federal law provides for highly effective school library programs as essential elements in the education of our nation’s children. Read the full position statement embedded below, or click this link to open in a new tab. NJASL Immediate Past President Janet Clark serves on the Department of Education's Regional Advisory Committee for the Mid Atlantic Region. The Mid Atlantic region includes New Jersey, Delaware, Maryland, Pennsylvania, and the District of Columbia. This committee seeks your feedback so that they can make recommendations to the United States Department of Education. All NJASL Members and supporters are encouraged to share their voice on the most pressing education issues (as you see them) and how the Department of Education's Comprehensive Centers can provide assistance to address these issues. Click here to access the short survey. Responses will be accepted through August 18, 2016. Please indicate the county where you in work if you are an educator or where you live for all others at the beginning of question number five before you enter your recommendations. This information will be directly accessed by the United States Department of Education but by indicating your county it will help us in compiling data for New Jersey. The Comprehensive Centers program is authorized by Title II of the Educational Technical Assistance Act of 2002 (ETAA), Education Sciences Reform Act (ESRA) of 2002. The Department of Education (Department) funds these Centers to provide technical assistance to State education agencies (SEAs) that builds SEA capacity to: support local educational agencies (LEAs or districts) and schools, especially low-performing districts and schools; improve educational outcomes for all students; close achievement gaps; and improve the quality of instruction. Before a competition for the Centers program is held, the ETAA requires the establishment of ten Regional Advisory Committees (RACs). The purpose of these committees is to collect information on the educational needs of each of the ten regions. To the extent the Secretary deems appropriate, the Department will use the information submitted by the RACs, along with other relevant regional surveys of needs, to establish priorities for the next cohort of Centers. Complete the application and Parent Permission slips located on the Enthusiastic Reader page of the NJASL Website. Include supporting evidence based on the criteria why you believe your candidate should be a 2016 Enthusiastic Reader. Mail all documents to the ENTHUSIASTIC READER AWARD address listed. Packets must be postmarked by September 30, 2016. Winners will be honored on Saturday, November 19 at the NJASL Fall Conference in Long Branch. Recently released: School Library Programs in New Jersey: Building Blocks for Realizing Student Potential with ESSA Legislation Opportunities. The survey was developed to coincide with the recent signing of the Every Student Succeeds Act (ESSA) which includes School Librarians and school library programs as an essential component in education. This reauthorization provides new opportunities for school librarians and school library funding. Based on survey results, NJLA and NJASL believe ESSA presents a critical opportunity to reinvest in school library programs, to unlock the potential in New Jersey students and prepare them for college and beyond. After months of review, the New Jersey Department of Education adopted changes to the New Jersey Common Core standards in language arts and math in May, 2016. They are now called the New Jersey Student Learning Standards. The updated standards should be fully utilized in place of the NJ Common Core Standards. View the complete NJASL statement. CALLING ALL PRESENTERS! We hope everyone has recharged from spring break and your creativity is blooming! Please consider presenting at next year’s conference! Click on this link to go to the conference page on the NJASL website. We have the proposal form and tentative schedule to help you plan! We are looking for presenters for two full days of programming! CALLING ALL MAKERS! Please consider presenting at our Saturday Maker Morning (11/19), where we will showcase the great makerspace projects going on in NJ libraries! Makers should complete the presenter proposal and are also welcome to present in our traditional workshop format on the other conference days. Proposals due by 6/30/16. Any questions, contact Lisa Bakanas (lisabakanas@gmail.com).